The Toyota Yaris is a decent bet if you want lots of space and luxury kit for an affordable price! It has great millage rates and is packed with all the latest features and accessories you would come to expect from a luxury vehicle. The unique design of the interior is spacious and comfortable and has all the latest customization options drivers like you want! With a 5 seat and 5 door design getting in and out is easy and convenient no matter who or what you are transporting. 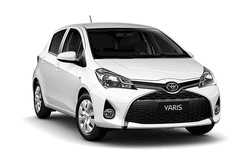 When you are in need of a quality and reliable rental car, the Toyota Yaris is here to deliver and to wow. Get to wherever it is you are going in comfort and style. Make your reservation today before this popular option is gone!